This program provides positive thoughts, concepts and belief structures to utilize the great opportuniutes that surround you. See yourself in the executive seat. With these powerful positive thoughts, concepts and beliefs embeded into this program great opportunities surround you. 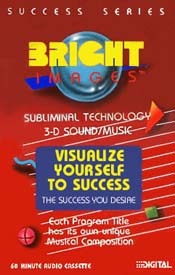 Visualize yourself all the way to the top, achieving your goals, overcoming your obstacles by focusing on specific thoughts (mental pictures from within) of your success. You will be motivated by your ablility to visiualize what you want in life.